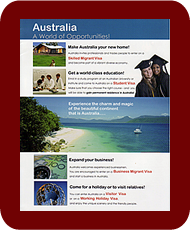 AMES (Australian Migration & Education Solutions Pty Ltd) is headed by a Registered Migration Agent (RMA) who will deal with your enquiries and give you advice and guidance on all issues to do with migrating to Australia. As RMA he has to be knowledgeable and up-to date with Australian Immigration law and the Immigration policy of the Australian Government. Immigration law and policy are subject to constant change, but AMES is kept informed about developments on a daily basis. Our RMA is always up-to-date with the legal and policy aspects of migrating to Australia and is able to interpret and apply both law and policy for the benefit of our clients. Immigration advice and assistance is provided to you by AMES' Managing Director, Juan Tobella, who is himself a migrant to Australia: he has had personal experience of what is involved in the process of gaining Permanent Residence in Australia. Unlike some others, therefore, he is able to relate to you and the issues you have to confront from his own personal experience. You'll find it makes a difference! AMES is based in Adelaide: the Australian Government centre which handles all visa applications for migration or permanent residence from professional and trades people all over the world is also in Adelaide and just round the corner from our office. AMES is familiar and up-to-date with the various Australian State/Territory-Sponsorship and Employer-Sponsorship Schemes, which make it easier for people to obtain a visa and to gain employment, and our Migration Agents know exactly what needs to be done for you to benefit from these schemes. AMES also has two Qualified Education Agent Counsellors, who offer advice and assistance with studing in Australia as well as gaining residence in Australia. By having a Registered Migration Agent on our staff, we are especially knowledgeable about how a period of study in specific fields can enhance your chances to gain Permanent Residence. We are able to give you clear and detailed advice on what study pathway to take and what options are available to you to realise your migration ambitions. 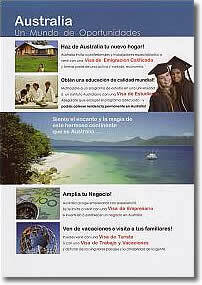 And we will assist you, of course, with all enrolment and student visa application processes. Because we uniquely combine education and migration expertise, AMES is regularly asked by other migration agents for advice and assistance with their clients, especially in relation to education issues. AMES has a network of trusted independent financial professionals who can give you advice on the financial aspects of moving to and settling in Australia. A recurrent theme in the testimonials we receive from our clients is that the people at AMES are not only KNOWLEDGEABLE, but they are FRIENDLY, and they are HONEST.